You would think by now I’d be immune to pre-race nerves. It’s not like I’ve not been here before. However those who’ve dealt with me this past week may have noticed a higher level of stress than normal. Little hints have been dropped in my tweets and facebook status too. The week following Roth I was tired, lethargic and heavy. I also wasn’t the least bit surprised by this. My motivation to train was fairly low as evidenced by how long I’d chat at the lake side and how little I’d spend in the water! Still that was all fine. With so much time to spare I drew up a plan for the Roth to UK period. Lining up my second week of training and how I’d bring myself back into form ready for a final easier week pre-UK. Fantastic. Then came the second week. I wasn’t heavy anymore, but still a little tired and lethargic. As for that motivation, well chatting on the lake side was more fun than swimming. I went for my first short run on Tuesday having opted out on the Monday. Just thirty minutes and it started out feeling great. Five minutes in and my calves were killing me! I had to cut it short and get home before I did damage! Now the panic really started to kick in. It hadn’t been this hard to get back into things before. Look at Lanzarote I first ran six days after that one! Wednesday saw a bit of training, but again no running. Apart from concern over the calves motivation was low and fear of being unable to run high! A really good massage in the early afternoon helped things along. Not that it stopped me skipping any training on Thursday and in the end it wasn’t till Friday when all I did was one, successful thirty minute run! Relief at last! I can run and whilst a little sorer than usual it felt good! I do still feel tired, but not as tired as I have done. I woke this morning and felt a little bit of that motivation had returned. Onto the scales and I’m at my target race weight! Then I was off to the lake and cycling felt good. To top it all off even the swimming felt better than it had all week. It’s a turning point! After days with a growing sense of panic suddenly the confidence returns. With confidence comes a bit of perspective too. I’d been convinced that the last two weeks my recovery was slower than for any of my previous races. Certain in fact that this week I should have been able to do so much more. Watching my training load drop off in WKO+ and convinced my fitness was ebbing away. If my recovery was slowing what chance did I have of racing? A well timed blog post on Ironman recovery from Chuckie V started reassuring me. Hs athlete had a similarly tight pair of races and the advice was really to hold back on the training. It raised a question. My perception has been that I’ve been recovering poorly and previously had got back into quality training much sooner. When I drew up the rapidly discarded training plans I assumed in week two I normally did 70% of a normal week. Significantly I assumed I needed to now and that if I couldn’t something was wrong. Was it really the case though? Fortunately I log my training and have plenty of data to go back and examine! WKO+ would let me test my perceptions and how far off the mark they were. Why I didn’t think of this days ago I don’t know! The obvious thing to compare is training hours. 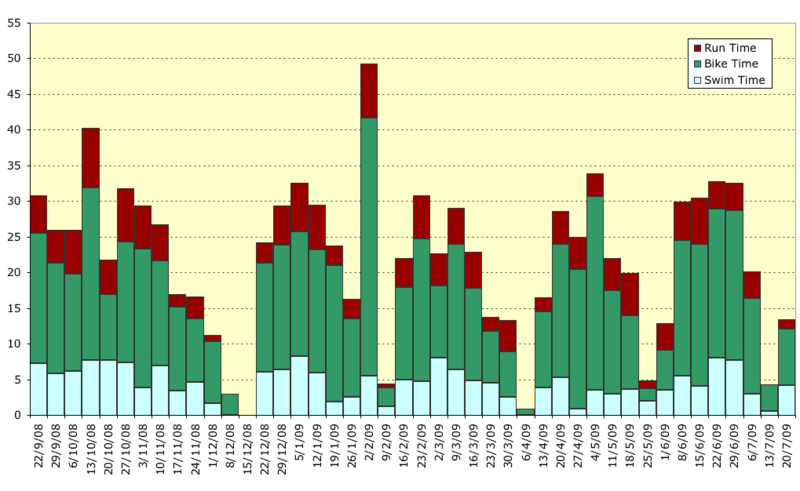 The chart above is a rough break down of my training hours as logged over the past 11 months. During that time I have four Ironman races to consider. There’s a few inaccuracies in there for sure, but it’s a rough guide. If you pick out the very low volume weeks of five hours or below you’ll see week one of my race recoveries. There’s one exception the week starting the 9th February 2009 was a recovery week from Epic Camp New Zealand. I needed that one too! I could very roughly draw a conclusion that the pattern was week one less than 5 hours total train, week two in the region of 10 to 15 hours total training and then week three typically more than 25 hours training. It’s a very rough conclusion though. For a start look at Western Australia the first race in the period. Recovery starts on the 8th December 2008. I can tell you the plan was to have a proper rest and mostly I did. The tiny bit of training was an ill advised three hour ride with a mate! The next week I did nothing and then through myself back into training in the third week. 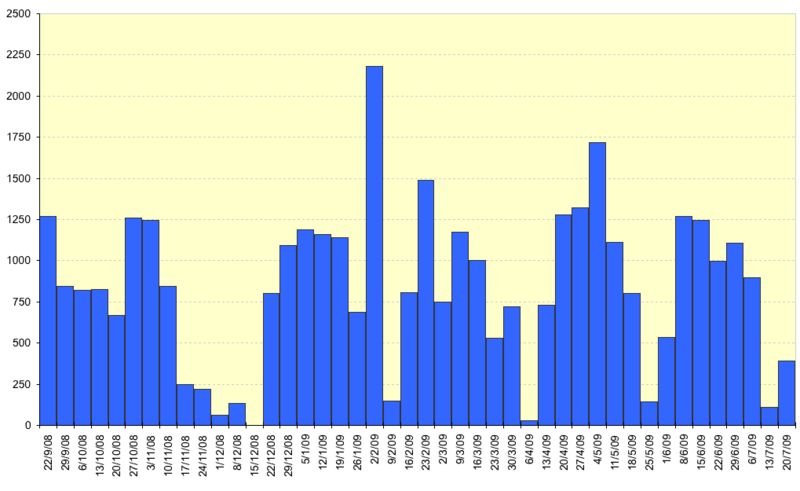 Rather than go by the bigger picture I’ve charted the 21 days following each Ironman race for total training volume. As mentioned Western Australia had almost no training in the following two weeks, but that was exactly the plan. For Ironman Australia the first week was largely spent travelling back to the UK so no time to train. Once home though I got back into training pretty quickly. Interestingly Lanzarote and Roth follow a very similar pattern for week 2. What you can see though is that after Roth I managed to get a little training done in the first week. Something I’d previously never managed. Again that was largely the plan. So whilst I wasn’t able to replicate the training after Ironman Oz, I certainly trained in a similar manner to Lanzarote. For all three of the earlier races week 3 involves a lot more training. Largely it appears a return to normal training really. If it wasn’t for the fact I’m racing in a weeks time I think Roth would likely be following a similar pattern. Whilst my perceptions and fear was that my recovery was worse than previous races the pattern looks very similar. With a race around the corner I’ll not be bumping up that volume though I’m tapering with just a little more training volume than normal. So does this mean my recovery is perfectly on track? If you’ve waded through recent posts you’ve read plenty on my usage of Training Stress Score (TSS) in WKO+. Volume is one part of the picture, but training stress is possibly a more useful one. 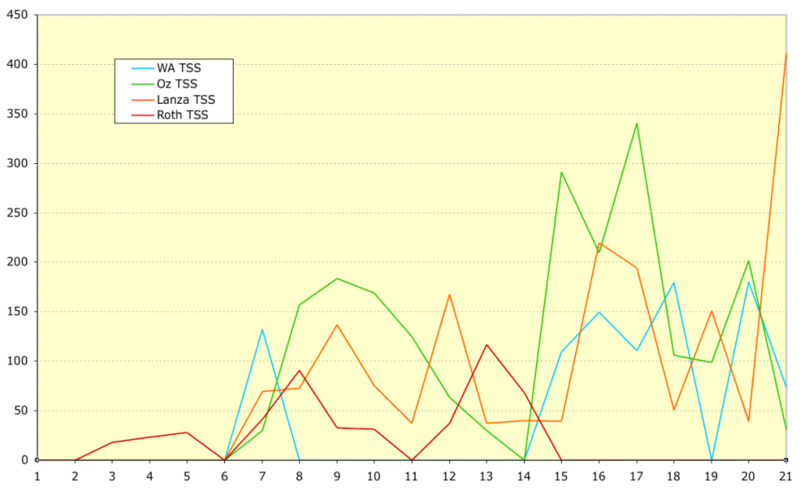 So the same 11 month chart as before, but this time plotting the TSS for each week. Very roughly weeks one to three post races follows a similar pattern to volume. So going straight to the 21 day chart to see how TSS varied for each race. Once again the pattern is pretty similar to the volume chart. The important thing to note here is how much lower the TSS is since Roth. Compared to Oz or Lanzarote I am clearly doing a lot more easy traning. The question is does that indicate greater fatigue or slower recovery? I can’t fully answer that if I’m honest. What I can say is that Ironman Australia was a very ‘flat’ race for me. I never felt at my best and I would claim that on race day my performance was quite low. Perhaps the ability to return to quite a high level of training so quickly was because the race hadn’t been as stressful as planned. Lanzarote is another odd case a complete disaster of a day for me. The intensity was significantly lower than usual, but the duration was far longer than usual. Was the cost a slower recovery relative to Oz? Looking at Roth the TSS is lower, but also I actually have some training stress during week one. Did this force me to keep the stress lower in week two? It’s certainly something I’ve never tried in the first five or six days after an event. What I won’t know is whether I could return to my normal training levels for week three. The plan is to keep these fairly low stress levels until race day. Having spent an hour or two putting graphs and charts together I’m not sure I’m any the wiser! 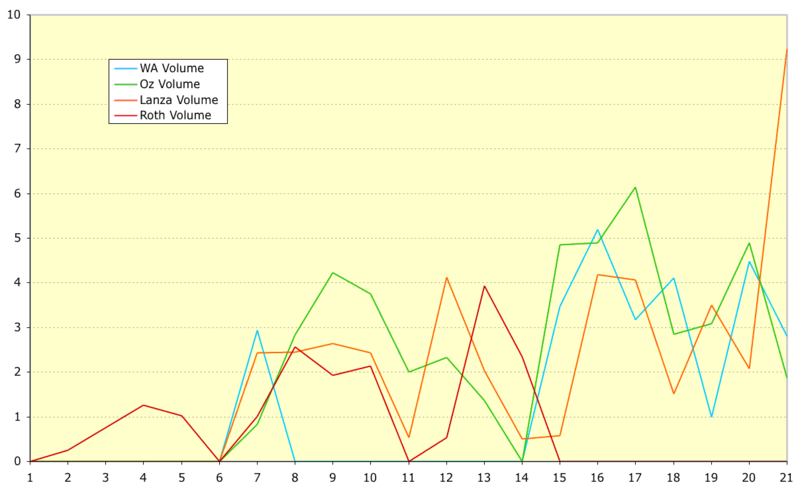 It appears that I’ve managed similar volumes of training, just not gone as hard, or spread it out a little more. I think there may be some signs there that I’ve not been recovering as well as I planned or hoped. However the problem is each race presents a unique set of circumstances making it hard to really compare any of them. I come back to my gut feel in the end. Having gone through this process I think I have been recovering more slowly than in previous races. I put a lot of this down to the intensity of racing in Roth. Despite claims of using it as training I went pretty hard and my recovery is slower as a consequence. Perhaps if I’d not taken time off after Western Australia I’d see a similar pattern? If that’s the case I’ll take some confidence that I picked up in week three and into week four there. The important thing is I’m not worrying anymore and starting to feel more confident for race day. Recovery is occuring. My legs may still be sore at times, but I’m noticing the changes and return to form. I’ll not be testing my fitness or trying to put out a normal weeks training this time though. The plan is to train a bit each day up till Thursday and hopefully give myself a little form for race day, but no more fatigue. Next Sunday we’ll find out if I’ve bitten off more than I can chew! No more charts or graphs prior to Ironman UK I promise! Maybe some afterwards and I will do those final ‘Justifications’ posts too. I’ll try and keep things short though!